Allergy Testing a HUGE success...so far!!! I am reading all the negative reviews on Amazon about the crate I just ordered for Ein. It amazes me how many people just cage their dogs without properly crate training them. Those poor scared dogs, and these people expect these crates to be indestructible. 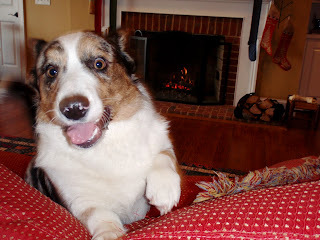 My Corgi Llyr is featured on The Daily Corgi blogspot! Today Llyr is part of the faces of DM on The Daily Corgi! But Mom, I'M THE BABY!!!! What wierd dog foods does your dog eat? Hello corgi people! Some of you might remember last year, I captained a team of corgis (and honorary corgis) to the second place fundraising team to benefit the Escondido Humane Society in North San Diego County. Finally atlast! We have enough snow to play in!! Just wanted to let everyone know that Oona is back safe and sound. Her incision is so tiny and has three hot pink stitches! I admit it is hard to keep her calm. She has wanted to play and bounce as if nothing happened. When Roslyn has surgery it is completely opposite, she is mopey and sleep for days after. So I am keeping Oona tethered to me for the next few days. Hope all is well with all the corgis in the world. Just wondering if anyone has any pictures of 2 corgis, a girl and a boy...dressed up for a wedding? I want to make some save the date cards for my recent engagement and need the perfect picture.